J.S.Kairouan (Division I) inked 25-year old Senegalese ex-international center Maodo Nguirane (210-105kg-93). He has a double citizenship as he also holds Spanish passport. Nguirane started the season at Saint Vallier Basket Drome in French NM1 league. In 10 games he recorded 7.6ppg and 8.4rpg this season. The most of last season Nguirane spent at CB Granada (LEB Silver) in league where in 15 games he averaged 6.1ppg and 4.7rpg. He helped them to win the Spanish LEB Silver title and the cup. Nguirane also played for Academik Plovdiv (NBL) in league. In 7 games he had 8.1ppg and 8.1rpg. He also played 4 games in Balkan League where he got 4.8ppg and 4.0rpg. Nguirane was a member of Senegalese Senior National Team two years ago. He has played also professionally for other Spanish teams like Unicaja Malaga, Tacoronte, Castello, Clinicas Rincon and Navarra. We bring you last week's top performances from Senegalese players who are playing abroad and who all have had prior experience of national team duties at youth or senior level. #1. This week's number one is former U18 international center Youssoupha Fall (221-95, currently plays in France). He led SIG Strasbourg to an easy victory against one of league's weakest teams Provence Basket (8-19) crushing them 107-74 in the French Jeep ELITE ProA in Tuesday night's game. Fall had a double-double by scoring 18 points and getting 12 rebounds. He also added 4 blocks in 23 minutes on the court. SIG Strasbourg (16-10) is placed sixth in the Jeep ELITE ProA. It's Fall's first season with the team. Fall has individually a very good year with high stats. He averages: 15.1ppg, 8.6rpg, 1.5bpg, 2FGP: 69.3%(140-202) and FT: 61.2% in 22 games he played so far. Fall played for the Senegalese U18 national team seven years ago. #2. Second place goes to former international center Moussa Diagne (211-94, currently plays in Spain). Diagne could not help Andorra (14-14) in their last game on Saturday. 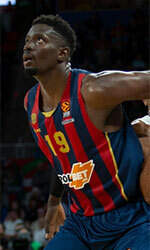 Despite his very good performance Andorra was edged 84-82 on the road by the higher-ranked Baskonia (#3). Diagne scored 15 points and grabbed 4 rebounds. Diagne's overall stats this season are: 7.6ppg, 5.6rpg, 2FGP: 54.9% and FT: 77.2%. He has a dual citizenship: Senegalese and Spanish. Worth to mention he played also at Eurobasket Summer League, which helped him get the job in pro basketball. Diagne played for the Senegalese national team in 2016. #3. The Senegalese player who performed third best last week abroad was an international center Gorgui Dieng (211-90, college: Louisville, currently plays in NBA). He was not able to help the Minnesota Timberwolves (36-46) in their last game. Despite Dieng's very good performance the Minnesota Timberwolves (36-46) lost 95-99 in Denver to the Nuggets. He had a double-double by scoring 18 points and getting 11 rebounds. Dieng also added and 3 steals in 34 minutes. It was Timberwolves' third consecutive loss in a row. The Regular Season already ended in the NBA. Dieng has been at the team for six years. This season his overall stats are: 6.4ppg, 4.1rpg, 2FGP: 53.0%, 3FGP: 33.9% and FT: 83.0% in 76 games. Dieng is also a member of the Senegalese senior national team. #4. Point guard Clevin Hannah (179-87, agency: BeoBasket, college: Wichita St., currently plays in Spain) was not able to secure a victory for Gran Canaria (12-13) in their last game on Sunday. Despite his very good performance Gran Canaria was defeated 77-71 at home by the second-ranked Real Madrid. Hannah was the top scorer with 19 points. He also added 5 passes. Hannah has relatively good stats this season: 11.9ppg, 1.9rpg and 3.9apg. He is another player who holds two passports: Senegalese and American. Hannah used to play for the Senegalese national team back in 2017. #5. International center Youssou Ndoye (213-91, college: St.Bonaventure, currently plays in France) was the major contributor in a 3-point JL Bourg's victory against the sixth-ranked Chalon/Saor (16-11) 79-76 in the French Jeep ELITE ProA last Tuesday. He had a double-double by scoring 14 points and getting 10 rebounds in 25 minutes. JL Bourg Basket (22-4) is placed second in the Jeep ELITE ProA. It was his team's sixth consecutive victory in a row. This year Ndoye has relatively solid stats: 14.2ppg, 8.3rpg and 1.4bpg in 23 games. He plays currently for the Senegalese national team. #6. An experienced forward Mouhammad Faye (207-85, college: SMU, currently plays in ABA League) contributed to an easy victory against the closely-ranked Buducnost (16-6) 91-72 in the ABA League on Friday night. Faye recorded 7 points, 5 rebounds and 2 blocks. It was the game of the round between two top 4 ranked teams. Crvena Zvezda MTS Beograd (21-1) is placed first in the ABA League. It was his team's fifth consecutive victory in a row. Faye's total stats this season are: 6.3ppg and 4.8rpg. He is an international player who is currently on the senior Senegalese National Team roster. #7. International power forward Babacar Toure (205-85, currently plays in Switzerland) led Fribourg to an easy victory against the third-ranked Massagno (4-4) crushing them 124-71 in the Swiss SBL in Saturday night's game. Toure scored 15 points, had 8 rebounds and dished 5 assists. It was the game of the round between two top 3 ranked teams in group Places 1-6. Fribourg Olympic (3-0) is placed first. So far his team won all three games in the Second Stage. There are only two games left until the end of the Second Stage. So now every game will be critical. Toure has reliable stats this season: 14.8ppg, 9.0rpg, 1.8apg and 1.1bpg. He is also Senegalese national team player. #8. Power forward Ibrahima Faye (207-97, currently plays in Belgium) couldn't help Leuven Bears (6-19) in their last game on Saturday. Despite his very good performance Leuven Bears was defeated 79-67 in Antwerp by the leading Giants. Faye recorded a double-double by scoring 17 points and getting 11 rebounds. Faye averaged so far 12.7ppg, 9.3rpg, 1.2apg and 1.3bpg. He used to play for the Senegalese national team back in 2016. #9. Former U18 international power forward Cheikh Sane (207-92, college: Marshall, currently plays in Denmark) contributed to a Horsens IC's victory against the third-ranked Naestved (14-10) 89-78 in the Danish BasketLigaen last Thursday. He recorded 7 points, 16 rebounds and 4 assists. It was the game of the round between two top 3 ranked teams in group ProA. Horsens IC (18-6) is placed second. It was his team's fifth consecutive victory in a row. Sane's total stats this season are: 5.7ppg, 6.6rpg, 1.7apg and 1.1spg. He used to play for the Senegalese U18 national team eleven years ago. #10. Center Maodo Nguirane (210-93, currently plays in Africa Basketball League) led his Tunisian team JS Kairouan to a 1-point victory against the leader ES Rades (3-0) 74-73 in the Africa Basketball League on Saturday night. Nguirane scored 15 points, grabbed 6 rebounds and dished 4 assists in 35 minutes. It was the game of the round between two top 2 ranked teams in group A. J.S.Kairouan (2-1) is placed second. Nguirane has very impressive stats this year: 18.4ppg, 11.4rpg, 1.8apg and 1.2spg in five games. He is a former international player as two years ago he still played for the Senegalese senior national team. #11. Former international forward Modou Mbaye (202-94, currently plays in Spain) led Tarragona to a 1-point victory over the third-ranked Quart 62-61 in the Spanish EBA (fourth division) in Sunday night's game. Mbaye was MVP of the game. He recorded a double-double by scoring 28 points and getting 12 rebounds. Mbaye's total stats this season are: 9.4ppg, 7.1rpg and 1.3apg. He used to play for the Senegalese national team two years ago. #12. International forward Maurice Ndour (206-92, college: Ohio, currently plays in VTB United League) managed to help Unics Kazan in a victory against the eighth-ranked Kalev/Cramo 107-95 in the VTB United League in Tuesday night's game. Ndour scored only one point in 12 minutes. Ndour's stats this year are: 11.0ppg, 4.4rpg and 1.3bpg in 12 games. He is also in the roster of the Senegalese national team. #13. International point guard Xane d'Almeida (181-83, currently plays in France) led Charleville-Mezieres to a 3-point victory over the third-ranked Union Tours 73-70 in the French NM1 (third division) last Friday. d'Almeida was the best player in that game. He recorded a double-double by scoring 16 points and making 12 passes. d'Almeida also added 6 rebounds and 3 steals. This season d'Almeida has very high stats. He averages: 15.5ppg, 4.2rpg, 7.0apg and 1.4spg. d'Almeida is also Senegalese national team player. #14. Former international center Pape Faye (200-87, currently plays in Japan) led Osaka Evessa to a victory against the leader Ryukyu GK 66-62 in the Japanese B League on Saturday night. He scored 11 points in a mere 19 minutes. This year Faye's total stats are: 8.1ppg and 4.9rpg in 57 games. He used to play for the Senegalese national team back in 2017. #15. International guard Lamine Sambe (188-89, currently plays in France) helped Rueil win their game against the ninth-ranked SO Maritime Boulogne 106-97 in the French NM1 (third division) in Saturday night's game. Sambe recorded 19 points, 4 rebounds and 5 assists. Sambe averaged so far 14.7ppg, 3.0rpg, 5.3apg and 1.5spg. He is also in the roster of the Senegalese national team. #1. Amath M'Baye (206-F-89, college: Oklahoma, currently plays in Italy). M'Baye could not help Virtus Bologna (12-13) to beat Pistoia Basket (6-19). He recorded 8 points, 6 rebounds and 4 assists in 29 minutes. Virtus Bologna lost 67-78 at home to the league outsider (#16) Pistoia Basket. M'Baye has reliable stats this year: 10.2ppg, 4.1rpg and 1.4apg in 25 games he played so far. He has a dual citizenship: Senegalese and French. #2. Malik Dime (206-F/C-92, college: Washington, currently plays in Bulgaria) led Rilski to an easy victory against one of league's weakest teams Academic Sofia (4-18) crushing them 95-64 in the Bulgarian NBL last Wednesday. Dime recorded a double-double by scoring 12 points and getting 10 rebounds. He also added 3 blocks. Rilski Sportist Samokov (11-10) is placed fourth in the NBL. It was his team's first victory after three consecutive loses. There are only three games left until the end of the Regular Season. So now every game will be critical. Dime has reliable stats this season: 13.9ppg, 8.8rpg and 2.8bpg. He is another player who holds two passports: Senegalese and American. #3. Michel Diouf (208-C-89, currently plays in Denmark) contributed to Bakken's victory against the fifth-ranked Randers (13-11) 95-85 in the Danish BasketLigaen on Thursday night. Diouf recorded 10 points, 8 rebounds and 3 blocks in 18 minutes. Bakken Bears (22-2) is placed first in ProA group. Diouf is one of the most experienced players in a team as it's his fourth year in Bakken's roster. This season his total stats are: 8.9ppg, 5.5rpg and 1.3apg in 18 games. #4. Ilimane Diop (210-C-95, currently plays in Spain) managed to help Kirolbet Baskonia Vitoria in a victory against one of league's weakest teams UCAM Murcia (7-18) 86-75 in the Spanish Liga Endesa last Sunday. Diop scored only 2 points and grabbed 4 rebounds in 13 minutes. Kirolbet Baskonia Vitoria (20-6) is placed third in the Liga Endesa. It was his team's sixth consecutive victory in a row. Diop plays sixth season for the team. This year his total stats are: 6.0ppg and 3.4rpg in 27 games. Diop has both Senegalese and Spanish nationalities. #5. Bira Seck (204-PF-90, agency: Interperformances, college: Idaho, currently plays in Japan) was the major contributor in a Tokyo Cinq Reves' victory against the closely-ranked Saitama Broncos (2-3) 88-84 in the Japanese B League D3 in Saturday night's game. Seck had a double-double by scoring 18 points and getting 13 rebounds. He also added 4 assists in 34 minutes. Tokyo Cinq Reves (4-3) are placed third in the B League D3. It was his team's fourth consecutive victory in a row. Seck's stats this year are: 14.1ppg, 8.2rpg and 1.8apg in 55 games. #6. Experienced Mamadou Dia (201-C/F-78, currently plays in France) was not able to help Provence Basket (8-19) in their last game. Despite Dia's good performance Provence Basket was crushed 107-74 on the road by the much higher-ranked (#6) SIG Strasbourg. He was the second best scorer with 11 points in only a mere 13 minutes. This year Dia's total stats are: 3.7ppg and 1.5rpg in 26 games. He also holds two passports: Senegalese and French. #7. Mamadou Samb (210-C/F-89, currently plays in Spain) contributed to an easy victory against the 14th-ranked Real Canoe crushing them 86-66 in the Spanish LEB Gold (second division) on Friday night. Samb scored 7 points and grabbed 4 rebounds. Samb's total stats this season are: 3.5ppg and 3.2rpg. He has Senegalese and Spanish nationalities. Despite Samb's Senegalese passport, he previously played for the Spanish U20 national team and is probably not eligible to play for the Senegalese team. #8. Ibrahima Camara (206-C/F-94, college: UNH, currently plays in Switzerland) was not able to secure a victory for Swiss Central (1-3) in their last game. Despite Camara's very good performance the fifth-placed Swiss Central was crushed 98-60 on the opponent's court by the higher-ranked (#3) Boncourt in the Places 7-11 group. He had a double-double by scoring 15 points and getting 11 rebounds in 32 minutes. Camara has individually a very good year with high stats. He averages: 16.1ppg, 8.7rpg and 1.1spg in 23 games. #9. Mouhamed Barro (205-F-95, currently plays in Spain) contributed to a 1-point Gipuzkoa's victory against the 13th-ranked Movil Estudiantes 93-92 in the Spanish Liga Endesa on Saturday night. Barro scored only 4 points. Barro has averaged so far 4.1ppg and 2.2rpg. #10. Atoumane Diagne (215-C-98, currently plays in Spain) couldn't help Barca II in their game against Real Betis in the Spanish LEB Gold (second division). He recorded 9 points, 6 rebounds and 2 blocks. His team was crushed by 23 points 81-58. Diagne has averaged so far 6.7ppg, 6.4rpg and 1.7bpg. Here is the weekly review of the top performing Senegalese players, who play currently abroad. #1. This week's number one is an international forward Maurice Ndour (206-92, college: Ohio, currently plays in VTB United League). Ndour led his Russian team Unics Kazan to a victory against the league leader CSKA (19-4) 83-73 in the VTB United League last Monday. He recorded 13 points and grabbed 5 rebounds. It was the game of the round between two top 4 ranked teams. Unics Kazan (17-4) is placed second in the VTB United League. It was his team's third consecutive victory in a row. Ndour has relatively good stats this season: 11.9ppg, 4.6rpg, 1.3bpg, 2FGP: 57.5%(50-87) and FT: 81.6%. He is currently a member of the Senegalese senior national team. #2. Second place goes to an international center Youssou Ndoye (213-91, college: St.Bonaventure, currently plays in France). Ndoye could not help one of league's weakest teams JL Bourg (20-4) in their last game on Sunday. Despite his very good performance JL Bourg was edged 82-81 on the road by the leading ASVEL Lyon-Villeurbanne Basket. Ndoye was the top scorer with 18 points. He also added 5 rebounds and made 3 blocks. This season Ndoye has relatively solid stats: 14.4ppg, 8.2rpg, 1.5bpg, 2FGP: 64.3%(119-185) and FT: 75.3%. He is in the roster of the Senegalese senior national team. #3. The Senegalese player who performed third best last week abroad was an international center Gorgui Dieng (211-90, college: Louisville, currently plays in NBA). Dieng was the major contributor in a 2-point Minnesota Timberwolves' victory against the Miami Heat (38-41) 111-109 in the NBA last Friday. He scored 19 points, grabbed 4 rebounds and made 2 blocks in 22 minutes. The Minnesota Timberwolves have 36-43 record this season. There are only three games left until the end of the NBA Regular Season. So now every game will be critical. It's Dieng's sixth year with the team. This season Dieng's overall stats are: 6.0ppg, 4.0rpg, 2FGP: 54.0%, 3FGP: 31.4% and FT: 82.7% in 73 games he played so far. He is also a member of the Senegalese senior national team. #4. Point guard Clevin Hannah (179-87, agency: BeoBasket, college: Wichita St., currently plays in Spain) contributed to an easy victory against the fourth-ranked Valencia Basket (15-10) 111-92 in the Spanish Liga Endesa on Saturday night. Hannah recorded 12 points, 9 assists and 3 steals. Herbalife Gran Canaria (12-12) is placed ninth in the Liga Endesa. Hannah has reliable stats this season: 11.5ppg, 1.8rpg and 3.9apg. He has a dual citizenship: Senegalese and American. Hannah used to play for the Senegalese national team back in 2017. #5. Former international center Moussa Diagne (211-94, currently plays in Spain) was not able to help Andorra in their game against Valencia Basket (15-10) in the Spanish Liga Endesa. Diagne scored 7 points and grabbed 9 rebounds in 16 minutes. Andorra was edged 73-72 at home by the higher-ranked (#4) Valencia Basket. They ended the series of three consecutive victories. This year Diagne averages: 7.3ppg and 5.7rpg in 24 games. He is another player who holds two passports: Senegalese and Spanish. Worth to mention he played also at Eurobasket Summer League, which helped him get the job in pro basketball. Diagne used to play for the Senegalese national team three years ago. #6. Center Youssoupha Fall (221-95, currently plays in France) was not able to secure a victory for SIG Strasbourg (14-10) in their game against JSF Nanterre (11-13) in the French Jeep ELITE ProA. He scored 8 points and grabbed 9 rebounds. SIG Strasbourg was defeated 92-86 in Nanterre by the lower-ranked JSF Nanterre (#9). It was SIG Strasbourg's first loss after three consecutive victories. It's Fall's first season with the team. Fall's stats this year are: 14.8ppg, 8.6rpg and 1.5bpg. He is a former U18 international player as he played for the Senegalese team seven years ago. #7. An experienced international forward Mouhammad Faye (207-85, college: SMU, currently plays in ABA League) contributed to an easy victory against the closely-ranked Partizan (14-8) crushing them 84-63 in a derby game in the ABA League on Saturday night. Faye scored 6 points and grabbed 5 rebounds in 17 minutes. It was the game of the round between two top 4 ranked teams. Crvena Zvezda MTS Beograd (21-1) is placed first in the ABA League. It was his team's fifth consecutive victory in a row. This year Faye's total stats are: 6.3ppg and 4.8rpg in 22 games. He is also Senegalese national team player. #8. Center Maodo Nguirane (210-93, currently plays in Africa Basketball League) led his Tunisian team JS Kairouan to a 1-point victory over the leader ES Rades (3-0) 68-67 in the Africa Basketball League in Saturday night's game. Nguirane was MVP of the game. He recorded a double-double by scoring 26 points and getting 10 rebounds. It was the game of the round between two top 2 ranked teams in group A. J.S.Kairouan (2-1) is placed second. Nguirane has individually a very good season with high stats. He averages: 19.3ppg, 12.8rpg, 1.3apg and 1.5spg. Nguirane used to play for the Senegalese national team back in 2017. #9. Former international power forward Ibrahima Faye (207-97, currently plays in Belgium) couldn't help Leuven Bears (5-18) in their last game. Despite his good performance Leuven Bears lost 64-68 in Charleroi to the higher-ranked (#3) Spirou. Faye had a double-double by scoring 13 points and getting 17 rebounds. He also added 9 blocks in 31 minutes. It was Leuven Bears' sixth consecutive loss in a row. Faye averaged so far 12.3ppg, 9.1rpg, 1.2apg and 1.4bpg in 21 games. He used to play for the Senegalese national team three years ago. #10. Power forward Ousmane Barro (207-84, college: Marquette, currently plays in Romania) couldn't help CS Dinamo Bucuresti (8-2) in their game against CSM Steaua Bucuresti (8-2) in the Romanian Liga Nationala. Despite his very good performance on Thursday night Barro was the second best scorer with 16 points. He also added 8 rebounds. The Second Stage already ended. Barro's stats this season are: 14.2ppg, 8.7rpg, 1.6apg and 1.4spg. He is a former U18 international player as seventeen years ago he still played for the Senegalese national team. #11. International power forward Babacar Toure (205-85, currently plays in Switzerland) contributed to Fribourg's victory against the third-ranked Lakers 102-97 in the Swiss SBL in Saturday night's game. Toure scored 11 points, grabbed 9 rebounds and made 2 blocks in 25 minutes. Toure averaged so far 14.8ppg, 9.1rpg, 1.7apg and 1.2bpg in 18 games. He plays currently for the Senegalese national team. #12. Former international center Pape Faye (200-87, currently plays in Japan) contributed to an easy victory against the sixth-ranked Fukuoka Rizing 77-61 in the Japanese B League in Wednesday night's game. He scored 15 points and grabbed 5 rebounds. Faye has averaged so far 8.2ppg and 5.0rpg. He used to play for the Senegalese national team back in 2017. #13. International forward Ibrahima Thomas (213-87, college: Cincinnati, currently plays in Lebanon) couldn't help Hoops Club in their game against Homentmen in the Lebanese LBL, despite his good performance last Saturday. Thomas recorded 11 points and grabbed 8 rebounds in 25 minutes. But his team lost 80-88. Thomas averaged so far 12.9ppg, 9.2rpg, 1.2bpg and 1.1spg in 15 games. He is also Senegalese national team player. #14. International point guard Xane d'Almeida (181-83, currently plays in France) led Charleville-Mezieres to a victory over the fifth-ranked Vitre 73-62 in the French NM1 (third division) on Saturday night. d'Almeida was the best player in that game. He scored 25 points, had 5 boards, passed 4 assists and added 5 steals. This season d'Almeida has very high stats. He averages: 15.4ppg, 4.1rpg, 6.8apg and 1.4spg. d'Almeida plays currently for the Senegalese national team. #15. International center Hamady N'Diaye (213-87, college: Rutgers, currently plays in Italy) couldn't help Sidigas AV in their game against VL Pesaro in the Italian Serie A. He cannot count Sunday's game as one of the best ones. N'Diaye scored only 2 points in 12 minutes. His team was edged 91-89. N'Diaye has averaged so far 6.4ppg, 4.5rpg and 1.9bpg in 17 games. He is also in the roster of the Senegalese national team. #1. Ilimane Diop (210-C-95, currently plays in Spain) led Baskonia to an easy victory against the 14th-ranked Movil Estudiantes (9-16) crushing them 104-67 in the Spanish Liga Endesa in Sunday night's game. He recorded 12 points and grabbed 5 rebounds in a mere 18 minutes. Kirolbet Baskonia Vitoria (18-6) is placed third in the Liga Endesa. It was his team's fourth consecutive victory in a row. It's Diop's sixth season with the team. This year Diop averages: 6.4ppg and 3.4rpg in 25 games he played so far. He has a dual citizenship: Senegalese and Spanish. #2. Amath M'Baye (206-F-89, college: Oklahoma, currently plays in Basketball Champions League) led his Italian team Virtus Bologna to a victory over the third-ranked JSF Nanterre (8-6) 73-58 in the Basketball Champions League on Wednesday night. M'Baye was MVP of the game. He scored 16 points in 31 minutes. Virtus Segafredo Bologna (10-4) is placed first in group D. It's M'Baye's first season with the team. This year M'Baye has relatively solid stats: 11.3ppg, 3.8rpg and 1.3apg in 18 games. He is another player who holds two passports: Senegalese and French. #3. Mamadou Samb (210-C/F-89, currently plays in Spain) contributed to a Real Betis' victory against the 11th-ranked CB Granada (7-16) 93-80 in the Spanish LEB Gold (second division) last Saturday. Samb scored 10 points and grabbed 4 rebounds. Real Betis Energia Plus Sevilla (26-4) is placed first in the LEB Gold. It was his team's sixth consecutive victory in a row. There are only four games left until the end of the Regular Season. So now every game will be critical. Samb has averaged so far 3.5ppg and 3.1rpg. He has both Senegalese and Spanish nationalities. Despite Samb's Senegalese passport, he previously played for the Spanish U20 national team and is probably not eligible to play for the Senegalese team. #4. Wally Niang (206-C-96, currently plays in Sweden) could not help Wetterbygden (12-24) in their last game. Despite Niang's very good performance Wetterbygden was badly defeated 80-64 at home by the higher-ranked (#3) Boras Basket. He had a double-double by scoring 17 points and getting 10 rebounds in 31 minutes. It was Wetterbygden's fourth consecutive loss in a row. Niang averaged so far 10.5ppg and 7.1rpg in 26 games. #5. Bira Seck (204-PF-90, agency: Interperformances, college: Idaho, currently plays in Japan) was the major contributor in a Tokyo Cinq Reves' victory against one of league's weakest teams Kagoshima (1-2) 78-74 in the Japanese B League D3 last Saturday. Seck scored 16 points and grabbed 8 rebounds. Tokyo Cinq Reves (2-3) are placed fifth in the B League D3. Seck averaged so far 14.1ppg, 8.0rpg and 1.8apg. #6. Mouhamadou Diop (212-C-87, currently plays in Spain) was the main contributor in L'Hospitalet's victory against the eighth-ranked Plasencia 69-65 in the Spanish LEB Silver (third division) on Saturday night. He was the top player that evening. Diop recorded 18 points, 9 rebounds and 5 blocks in 29 minutes. Diop has averaged so far 9.8ppg and 5.8rpg in 28 games. #7. Mouhamed Barro (205-F-95, currently plays in Spain) managed to help Delteco Gipuzkoa BC San Sebastian in a 1-point victory against the 14th-ranked Movil Estudiantes 93-92 in the Spanish Liga Endesa last Saturday. He scored only 4 points in 10 minutes. Barro has averaged so far 4.1ppg and 2.2rpg in 19 games. #8. Abdou Thiam (204-F/C-98, currently plays in Spain) helped Betanzos win their game against the 14th-ranked Agustinos-Leclerc 79-72 in the Spanish EBA (fourth division) on Sunday night. He scored 16 points, had 9 rebounds and made 5 blocks. Thiam has individually a very good season with high stats. He averages: 17.8ppg, 14.6rpg, 1.6bpg and 1.2spg. #9. Samuel Gaye Serigne (198-PF-96, agency: Players Group, currently plays in Italy) was not able to help Cecina (8-19) in their last game. Despite Gaye Serigne's very good performance the 15th-placed Cecina was edged 78-76 on their home court in Cecina by the much higher-ranked (#6) Vigevano in the Group A. He had a double-double by scoring 20 points and getting 14 rebounds in 45 minutes. Gaye Serigne averaged so far 11.8ppg and 6.0rpg in 27 games. He also holds two passports: Senegalese and Italian. #10. Diarra Sidate (210-F-90, currently plays in Japan) helped Cyberdyne IR win their game against the fifth-ranked Yamagata 85-81 in the Japanese B2 League last Saturday. Sidate scored 7 points and grabbed 5 rebounds. Sidate has averaged so far 3.7ppg and 3.9rpg. He holds both Senegalese and Japanese passports. #1. 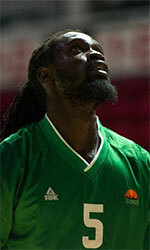 This week's number one is former international center Moussa Diagne (211-94, currently plays in Spain). Diagne was the major contributor in Andorra's victory against the 16th-ranked Gran Canaria (8-17) 99-85 in the Spanish Liga Endesa in Sunday night's game. He scored 15 points and grabbed 8 rebounds in a mere 17 minutes on the court. MoraBanc Andorra (13-12) is placed eighth in the Liga Endesa. This year Diagne averages: 7.3ppg, 5.5rpg, 2FGP: 56.2%(50-89) and FT: 76.4% in 23 games he played so far. He has a dual citizenship: Senegalese and Spanish. Worth to mention he played also at Eurobasket Summer League, which helped him get the job in pro basketball. Diagne played for the Senegalese senior national team three years ago. #2. Second place goes to former U18 international center Youssoupha Fall (221-95, currently plays in France). Fall led SIG Strasbourg to a victory over the league outsider Olympique Antibes (5-19) crushing them 75-55 in the French Jeep ELITE ProA on Saturday night. He was MVP of the game. Fall scored 12 points, grabbed 9 rebounds and made 2 blocks in 20 minutes. SIG Strasbourg (14-9) is placed sixth in the Jeep ELITE ProA. It was his team's third consecutive victory in a row. Fall has individually a very good year with high stats. He averages: 15.2ppg, 8.5rpg, 1.5bpg, 2FGP: 67.6%(123-182) and FT: 57.5% in 19 games. Fall played for the Senegalese U18 national team in 2012. #3. The Senegalese player who performed third best last week abroad was former international point guard Clevin Hannah (179-87, agency: BeoBasket, college: Wichita St., currently plays in Spain) faced previously mentioned Moussa Diagne in the Spanish Liga Endesa last game. Hannah. He could not help Gran Canaria (12-11) in their last game. Despite Hannah's very good performance Gran Canaria lost 85-99 on the road to the lower-ranked (#8) Andorra. He was the second best scorer with 18 points in 20 minutes. They ended the series of four consecutive victories. It's Hannah's first season with the team. Hannah has relatively good stats this year: 11.5ppg, 1.9rpg, 3.6apg, 2FGP: 44.8%, 3FGP: 42.3% and FT: 91.3%(42-46) in 16 games. He is another player who holds two passports: Senegalese and American. Hannah played for the Senegalese national team two years ago. #4. Center Youssou Ndoye (213-91, college: St.Bonaventure, currently plays in France) contributed to a JL Bourg's victory against one of league's weakest teams Levallois (4-19) 96-85 in the French Jeep ELITE ProA on Monday night. He scored 16 points and grabbed 8 rebounds. JL Bourg Basket (19-4) is placed second in the Jeep ELITE ProA. It was his team's third consecutive victory in a row. This season Ndoye has relatively solid stats: 14.2ppg, 8.4rpg and 1.4bpg. He is also Senegalese national team player. #5. International center Gorgui Dieng (211-90, college: Louisville, currently plays in NBA) helped Minnesota Timberwolves edge the Golden State Warriors (51-24) 131-130 in the NBA in Friday night's game. Dieng had a double-double by scoring 14 points and getting 10 rebounds in 22 minutes. The Minnesota Timberwolves have 34-41 record this season. Dieng has been at the team for six years. This year his overall stats are: 5.6ppg and 4.0rpg in 69 games. Dieng plays currently for the Senegalese national team. #6. Forward Maurice Ndour (206-92, college: Ohio, currently plays in EuroCup) was not able to help Unics Kazan (5-1) in their last game on Friday. Despite his good performance the first-placed Unics Kazan (5-1) was defeated 79-73 in Valencia by the leading Basket in the group H of Eurocup. Ndour was the second best scorer with 11 points. He also added 2 shots. Ndour's total stats this season are: 9.6ppg, 4.2rpg, 1.2bpg and 1.1spg. He is an international player who is currently on the senior Senegalese National Team roster. #7. International center Cheikh Mbodj (208-87, agency: Octagon Europe, college: Cincinnati, currently plays in Poland) helped Twarde Pierniki win their game against the closely-ranked Stelmet Enea BC (20-5) 110-107 in the Polish EBL on Tuesday night. Mbodj scored 10 points in 16 minutes. It was the game of the round between two top 4 ranked teams. Polski Cukier Torun (21-4) is placed second in the EBL. It was his team's sixth consecutive victory in a row. Mbodj has reliable stats this year: 12.4ppg, 6.0rpg, 1.2apg and 1.8bpg in 25 games. He is also Senegalese national team player. #8. Center Maodo Nguirane (210-93, currently plays in Africa Basketball League) was the main contributor in a 1-point JS Kairouan's victory against the leader ES Rades (3-0) 68-67 in the Africa Basketball League last Saturday. Nguirane was the best player in that game. He had a double-double by scoring 26 points and getting 10 rebounds in 39 minutes. It was the game of the round between two top 2 ranked teams in group A. J.S.Kairouan (2-1) is placed second. Nguirane has very impressive stats this year: 19.3ppg, 12.8rpg, 1.3apg and 1.5spg in four games. He used to play for the Senegalese national team back in 2017. #9. Former international power forward Ibrahima Faye (207-97, currently plays in Belgium) was not able to secure a victory for Leuven Bears (5-16) in their game against Spirou Charleroi (14-7) in the Belgian Euromillions League. Despite his very good performance on Friday night Faye recorded a double-double by scoring 13 points and getting 17 rebounds. He also added 9 blocks. Faye averaged so far 12.5ppg, 9.2rpg, 1.2apg and 1.3bpg. He used to play for the Senegalese national team three years ago. #10. An experienced forward Mouhammad Faye (207-85, college: SMU, currently plays in ABA League) couldn't help Crvena Zvezda (21-1) in their game against Partizan (14-8) in the ABA League. Faye scored only 4 points and grabbed 4 rebounds in 15 minutes. The league leader Crvena Zvezda was edged 70-67 in a derby game by the lower-ranked (#4) Partizan. This year Faye's total stats are: 6.3ppg and 4.8rpg in 21 games. He is an international player who is currently on the senior Senegalese National Team roster. #11. Former U18 international power forward Ousmane Barro (207-84, college: Marquette, currently plays in Romania) helped CS Dinamo Bucuresti win their game against the fourth-ranked Phoenix Galati 84-75 in the Romanian Liga Nationala on Sunday night. Barro had a double-double by scoring 16 points and getting 11 rebounds in 36 minutes. His stats this year are: 14.1ppg, 8.8rpg, 1.6apg and 1.4spg in 12 games. Barro used to play for the Senegalese U18 national team seventeen years ago. #12. International point guard Xane d'Almeida (181-83, currently plays in France) helped Charleville-Mezieres win their game against the third-ranked Etoile Angers 90-73 in the French NM1 (third division) in Friday night's game. d'Almeida was the top player that evening. He recorded 23 points, 6 rebounds and 9 assists in 36 minutes. d'Almeida averaged so far 15.0ppg, 4.1rpg, 6.9apg and 1.2spg in 27 games. He is also in the roster of the Senegalese national team. #13. International center Moise Diame (206-86, currently plays in France) helped Saint Vallier win their game against the seventh-ranked Rueil 78-60 in the French NM1 (third division) in Tuesday night's game. Diame scored 12 points, grabbed 9 rebounds and made 2 blocks. Diame averaged so far 10.3ppg, 6.8rpg, 2.0apg and 1.5spg. He is also Senegalese national team player. #14. International power forward Jules Aw (202-86, currently plays in Switzerland) helped Massagno win their game against the sixth-ranked Lakers 93-85 in the Swiss SBL last Sunday. Aw recorded 8 points, 9 rebounds and 4 assists in 29 minutes. Aw has very impressive stats this year: 18.2ppg, 11.7rpg, 1.6apg and 1.8spg in 18 games. He plays currently for the Senegalese national team. #15. U18 international center Biram Faye (206-0, currently plays in Spain) couldn't help Fontedoso Carrefour in their game against L'Hospitalet in the Spanish LEB Silver (third division). Despite his good performance on Saturday night Faye recorded a double-double by scoring 11 points and getting 14 rebounds. He also added 2 blocks. Faye averaged so far 11.2ppg, 8.3rpg and 1.5bpg. He is also in the roster of the Senegalese U18 national team. #1. Amath M'Baye (206-F-89, college: Oklahoma, currently plays in Italy) contributed to a Virtus Bologna's victory against the 14th-ranked VL Pesaro (6-17) 78-70 in the Italian Serie A last Sunday. He scored 10 points, grabbed 6 rebounds, passed 3 assists and added 3 blocks. Virtus Segafredo Bologna (12-11) is placed ninth in the Serie A. M'Baye has relatively good stats this season: 10.3ppg, 4.1rpg and 1.2apg. He has a dual citizenship: Senegalese and French. #2. Malik Dime (206-F/C-92, college: Washington, currently plays in Bulgaria) could not help Rilski (10-10) in their last game on Monday. Despite his very good performance Rilski was defeated 84-77 on the road by the second-ranked Beroe. Dime recorded a double-double by scoring 20 points and getting 11 rebounds. He also added 4 blocks. There are only four games left until the end of the Regular Season. So now every game will be critical. Dime has relatively good stats this season: 14.1ppg, 8.6rpg and 2.8bpg. He is another player who holds two passports: Senegalese and American. #3. Michel Diouf (208-C-89, currently plays in FIBA Europe Cup) was not able to help Bakken (3-3) in their last game on Wednesday. Despite Diouf's very good performance Bakken (#2) was badly defeated 86-70 in Wuerzburg by the leading s Oliver Baskets in the group L of FIBA Europe Cup. He was the second best scorer with 15 points. Diouf also added 3 passes. Diouf is one of the most experienced players in a team as it's his fourth year in Bakken's roster. He averaged so far 12.3ppg, 5.2rpg and 1.4bpg. #4. Tacko Fall (229-C-95, currently plays college basketball in the States), who plays in the NCAA was not able to secure a victory for the University of Central Florida in their last game on Friday. Despite Fall's good performance his team was defeated 73-58 in a derby game by the University of Central Florida. He recorded a double-double by scoring 13 points and getting 18 rebounds. Fall also added 5 blocks. Fall plays fourth season for the team. He has averaged so far 6.3ppg and 4.8rpg. #5. Bira Seck (204-PF-90, agency: Interperformances, college: Idaho, currently plays in Japan) couldn't help Tokyo Cinq Reves (1-3) in their last game on Sunday. Despite his very good performance Tokyo Cinq Reves were crushed 83-62 in a derby game by the second-ranked Tokyo Excellence. Seck recorded a double-double by scoring 20 points and getting 10 rebounds. Seck averaged so far 14.1ppg, 8.0rpg and 1.8apg. #6. Wally Niang (206-C-96, currently plays in Sweden) couldn't help Wetterbygden (12-24) in their last game. Despite his very good performance Wetterbygden was badly defeated 80-64 at home by the higher-ranked (#3) Boras Basket. Niang had a double-double by scoring 17 points and getting 10 rebounds in 31 minutes. Niang averaged so far 10.6ppg and 7.4rpg in 24 games he played so far. #7. Ibrahima Camara (206-C/F-94, college: UNH, currently plays in Switzerland) couldn't help Swiss Central (1-1) in their last game on Saturday. Despite his very good performance Swiss Central (#2) was badly defeated 84-68 in Lugano by the leading Tigers in the Places 7-11 group. Camara recorded a double-double by scoring 22 points and getting 13 rebounds. Camara has individually a very good season with high stats. He averages: 16.2ppg, 8.6rpg and 1.1spg. #8. Yande Fall (203-C/F-90, currently plays in Italy) couldn't help Viola RC (7-3) in their last game on Friday. Despite Fall's very good performance Viola RC (#2) was defeated 77-73 on their home court in Reggio Calabria by the much lower-ranked Capo d'Orlando (#11) in the Group D. He was the top scorer with 18 points. Fall also added 9 rebounds. Fall averaged so far 11.0ppg and 8.4rpg. He has both Senegalese and Italian nationalities. #9. Experienced Khalifa Diop (208-C-2, currently plays in Euroleague) couldn't help Gran Canaria in their game against Maccabi T-A in the Euroleague. Diop cannot count Thursday's game as one of the best ones. He scored only 3 points and grabbed 4 rebounds in 7 minutes on the court. It was his first game for Gran Canaria this season. His team was crushed by 35 points 90-55. #10. Abdou Thiam (204-F/C-98, currently plays in Spain) was the major contributor in Betanzos' victory against the 13th-ranked Rosalia crushing them 84-57 in the Spanish EBA (fourth division) last Sunday. Thiam recorded a double-double by scoring 15 points and getting 13 rebounds. He also added 4 assists and 2 blocks. This season Thiam has very high stats. He averages: 17.9ppg, 14.9rpg, 1.4bpg and 1.1spg.